Fred Lear of Bangor pictured during his Feb. 1 amateur fight in Bangor against Zac Richard, is pursuing mixed martial arts at the professional level. The John Bapst Memorial High School graduate had a 6-2-1 amateur record. As quickly as Fred Lear could put pen to paper last week, his mixed martial career entered its next stage. 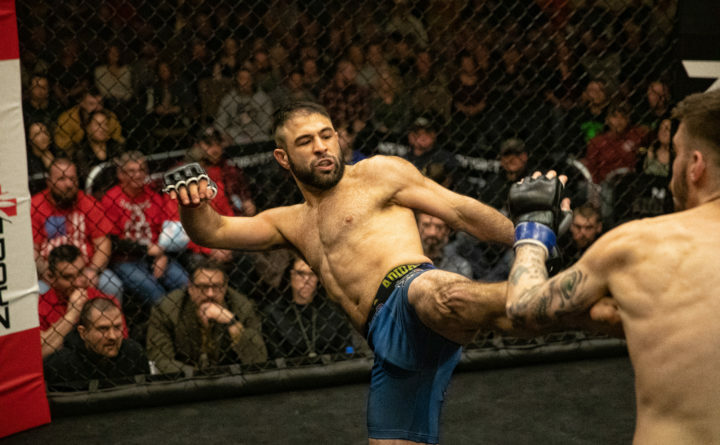 The Bangor resident, who already works at a restaurant and a nightclub in the Queen City, will add a third job to his busy routine when he makes his professional MMA debut April 27 against Bryant Bullock on New England Fights’ NEF 38 card at Aura in Portland. Lear’s ultimate ambition is not merely to fight professionally but to compete at the highest level of his sport. Lear credits John Bapst football coach Dan O’Connell and other motivational people for helping give him the right mindset. “These people told me you can achieve anything you want to, you can dream big, you just have to be willing to work for it, not quit and believe in yourself when sometimes that’s not so easy to do,” he said. Lear is turning pro after compiling a 6-2-1 amateur record since 2013. He was ranked fifth among 110 active New England amateur featherweights [145 pounds] by tapology.com. He looks back on joining the wrestling team at John Bapst after being cut from basketball as an important step in building his competitive resume. Lear wrestled for one season at Western New England University before returning to Bangor where he continued studies at Eastern Maine Community College and began training at Young’s MMA. He made his amateur MMA debut Aug. 3, 2013, with a first-round technical knockout via punches over Joshua Tucker at NEF 9 in Biddeford. “I was terrified. I had never done anything like that,” Lear said. Lear’s amateur MMA highlight came in August 2017 when he captured the NEF amateur bantamweight title with a second-round TKO of Walt Shea before a hometown crowd at the Cross Insurance Center. Lear returned to the cage for the first time since that bout Feb. 1 and fought undefeated Zac Richard to a five-round draw in their battle for the vacant NEF amateur featherweight crown before another sold-out throng of 1,200 fans in the CIC’s grand ballroom. “I’m blessed that we have the fan base, specifically in New England and Maine, that allows us the opportunity to do this,” Lear said. Lear’s first pro opponent, who is based at Hayastan MMA in North Carolina, moved up from the amateur ranks Sept. 22 with a second-round TKO over Marcus Levester at the Greenville [North Carolina] Convention Center. The 26-year-old Bullock also spent six years as an amateur and compiled a 7-5 record — after an 0-3 start — and won a regional amateur title. Lear will face Bullock at the 135-pound bantamweight limit but is likely to fight mostly as a featherweight where he was unbeaten as an amateur. “I want to be able to look back when it’s all said and done and be able to assure myself when I look in the mirror that I gave it everything I could,” Lear said. Another Bangor-area mixed martial artist with professional ambitions remained undefeated with another victory last Saturday night. Glory Watson, a 24-year-old flyweight from Young’s MMA in Bangor, improved to 4-0 with a three-round unanimous decision over previously unbeaten Alyssa “Bam” Marini of Kingston, New Hampshire, in the AMMO Fight League 6 show at The Big E in West Springfield, Massachusetts. This marked the first out-of-state fight for Watson after three bouts on New England Fights cards, the most recent on Feb. 1 in Bangor when she stopped Wisconsin’s Rachael Lippert by first-round submission via guillotine choke. Watson is the ninth-ranked women’s fighter, pound for pound, in New England by tapology.com. Marini, who had won her first two bouts by first-round stoppages, fell to 2-1.